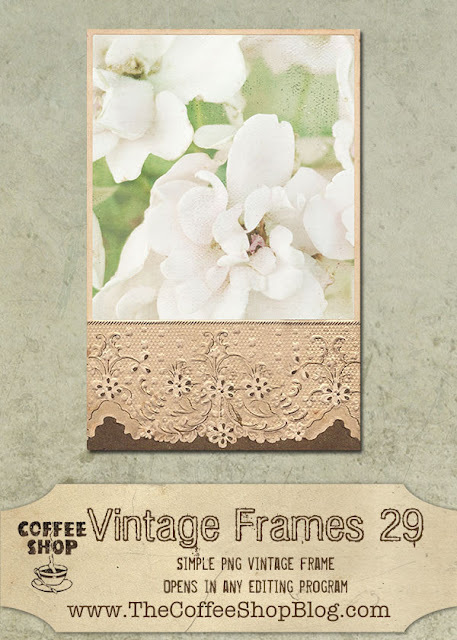 The CoffeeShop Blog: CoffeeShop Vintage Frames 29! Another in my series of vintage frames made from vintage images at The Graphic Fairy. This one is a simple .png file, so simply slip your image under this frame. This frame would be lovely printed or put on your website/blog. Download the free CoffeeShop Vintage Frames 29. You can also download it here. I love this, Rita! Thanks so much! Thank you so much for sharing this beautiful frame with us - I love all your creations. Ohmygoodness! i am soooo glad i found you again!!! i do mostly heritage scrapping, so i LOVE, LOVE, LOVE your frames! Yours are the first frames i look at when i need vintage frames. Thank you so much. i now have you bookmarked again! This is SO BEAUTIFUL!!! Thank you!